Fifteen-year-old Chise Hatori has not had an easy life. After witnessing (and taking the blame for) her mother's suicide, she was passed from relative to relative, shunned each time for her ability to see spirits. Eventually she sells herself at a magic auction, where she is bought by Elias Ainsworth, a mysterious and ancient mage. Elias tells Chise that she's a “sleigh beggy,” a generator of magical power, and that he plans to make her his apprentice – and his eventual bride. Chise isn't sure what to think at first, but the longer she lives with Elias and learns about the world she's always seen but not understood, the closer she comes to seeing value not only in life, but in herself. 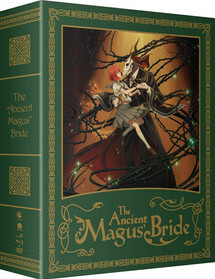 Based on the manga of the same name by Kore Yamazaki , The Ancient Magus' Bride is a story filled with the melancholy of the darker British folktales and lore. It could hardly help being so – the heroine of the story, teenager Chise Hatori, begins the story by putting herself up for sale at a magical auction, where she is bought by the much-older Elias Ainsworth. Rather than using slavery as its theme, or even as a thematic crutch, however, the device is used more to showcase how very down on herself Chise is. When she was little, Chise's mother told her that she should never have been born before throwing herself off of a balcony before her daughter's eyes. This moment became the defining one in Chise's life, telling her that she's so awful that not even her own mother can stand to be around her. What made her this way was, in her mind, obviously her gift of what is sometimes called The Sight, the ability to see spirits and fey creatures. This trait leads Chise to withdraw into herself, which in turn makes the relatives already reluctant to take her in see her as a difficult child; when the story starts, Chise sees selling herself as the only viable option besides death left open to her – and she may even be hoping that the sale will lead to that second outcome. While there is more of a hopeful tone as the series heads towards its second half (which will be released as part two of the show), Chise's evident despair does color much of this one. That's not to say that things are outright depressing, but rather that many of Chise's encounters are skewed towards her understanding not only her own worth and skill, but also that death is nothing more than a natural part of the cycle of life. This is seen specifically in the episodes about the cait sidhe (cat fairies), but also in Ruth the Church Grim's backstory as a loyal dog and Chise's encounters with an elderly dragon. Chise's life expectancy as a sleigh beggy and Elias' actual age also factor in, but for the most part the show uses British folklore and mythology to get its point across. That makes things perhaps less heavy-handed than they might otherwise have been, and it still allows us to see how very much Chise is dictated to by her insecurities, even as she begins to see that the world is not quite what she had always assumed. The use of British folklore is a key component of this series, and it is an interesting mix of faithful to the source and tinkered with for the show's purposes. The biggest example of the latter is the fact that a “sleigh beggy” does not appear to be an actual thing in mythology; it isn't in any of my folklore texts or online outside of the context of the series, at any rate. That does set the world of the story to be its own specific brand of British folklore, which may explain some of the other inconsistencies, such as the way the selkie looks and acts (typically she should be a beautiful adult woman when in human form) and Puckish nature of Oberon, who here is very much a combination of Puck and Oberon in contrast to many of the myths of the fairy court. There's also an interesting combination of cultures in the folklore presented, with Lindel being of Finnish descent and Church Grims originating in Swedish folklore rather than British. (They migrated eventually, however.) The fey beings residing in the England of the series are also a combination of English, Welsh, Irish, and Scottish myths; while today we do tend to group the countries together and there are a lot of similarities, it still feels a little odd in the context of the story. That said, the use of the folklore does help with the message that there is a natural cycle of things, something it is important for Chise to realize, and Elias' horned head feels very much like a reference to the Horned God of mythology who dies so that the spring will return again. Given the issues that Elias has over the course of these episodes with his form and health, this feels like an apt comparison, with him hoping that Chise will be his priestess and bring him back to life again. That he decides to do this by marrying her is more problematic, something which does not go unnoticed by other characters in the show. (Lindel particularly seems to be displeased by the idea.) For viewers, what's concerning is not only the age gap between them, but the fact that Elias largely treats Chise like a pet, calling her his “puppy” and talking down to her. That Chise seems to imprint upon him very much like a baby animal doesn't help matters; he may be the first person in a long time to actually care for her, but their relationship is far from being what we'd call healthy. Although beautiful in art, animation, and music, The Ancient Magus' Bride is not going to be a series for the short of attention span. Episodes are meandering in terms of pacing, and while that works for the feel the series is going for, it does mean that some episodes can drag and that the series feels slow as a whole. While the acting is excellent in both dub and sub, both casts speak in measured tones and low voices; this again absolutely works for the mood and feel, but it also slows down the action of each individual episode. Simply put, if you're looking for supernatural action, you won't find it here. Extras included on-disc are the standards for Funimation – an episode commentary (wherein Jamie Marchi forgets who she plays), Twitter Q & A, and clean songs. The limited edition further comes in an illustrated box with space for part two and a booklet of character/creature profiles and some storyboards. This is very nicely done, but you should be aware that it covers both halves of the show, and so does have some spoilers. Also included on the discs is the prequel three-part OVA , which deals with Chise's encounter with a library version of mayoiga, a sort of Japanese Brigadoon. This is much, much sadder than the main series, and although it is a prequel, having familiarity with the main story is recommended before watching it. Interestingly enough, there is no dub for the prequel. The Ancient Magus' Bride is neither folk nor fairy tale, but instead wears its inspiration from them on its sleeve. Melancholy and beautiful, it is a slow story that won't appeal to all viewers. For those who don't mind a gentle pace and a few teary sniffles, however, it is a lovely piece of storytelling that shows that no matter how far we go, the original stories that explained our world are always right there with us.